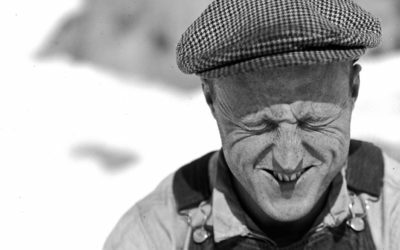 In 1943, at the height of the Second World War, the British Government launched a top-secret expedition to the Antarctic. Cabinet approval for the expedition was granted on 28th January 1943 and the expedition set out just 10 months later, in November 1943. To organise such a complex operation in such a short space of time during wartime was a major feat. Code-named Tabarin, the organisation of the expedition involved many late nights and a certain amount of chaos, just like the Paris nightclub it was named after. The role of Operation Tabarin was ostensibly to deny safe anchorages to enemy raiding vessels and to gather meteorological data for allied shipping in the South Atlantic. Tabarin also actively reinforced British territorial claims in the Falkland Islands Dependencies at a time when this was being challenged. The expedition was put together and led in 1943-44 by James Marr, a marine zoologist. 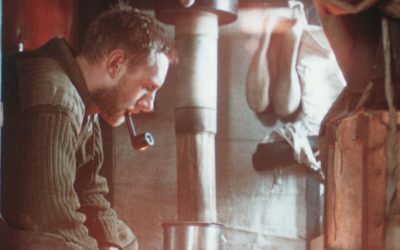 From the outset survey and science work were planned by an advisory committee – Antarctic veterans James Wordie, Neil Mackintosh and Brian Roberts. In the field, the expedition was directed by the Secretary of State for the Colonies via the Governor of the Falkland Islands. The expedition reached the Falkland Islands at the end of January 1944, from where the 14 men of Operation Tabarin started their Antarctic expedition in earnest. 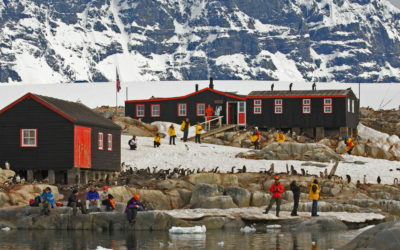 Marr, along with 2nd-in-command Victor Marchesi, Captain of the support ship HMS William Scoresby, set up bases on Deception Island (Base B) and Port Lockroy (Base A). 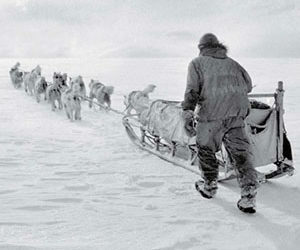 Andrew Taylor, a surveyor from the Royal Canadian Engineers, led the 2nd year, establishing Hope Bay (Base D) as the centre for dog-sledge-based fieldwork on the mainland. In all 14 men wintered the first year, 21 the second. From July 1945 the expedition was put on a permanent footing as the Falkland Islands Dependencies Survey (FIDS). The three bases were relieved in March 1946 and most expedition members returned to the UK. The success of the expedition is remarkable, not least because of the challenges the team had to overcome. 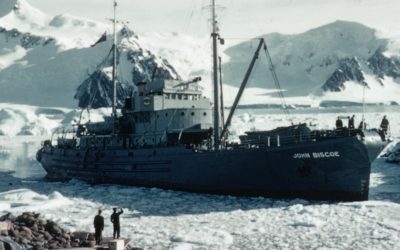 These included the extremely short lead-in time (Feb-Nov 1943), the shortcomings of the first expedition ship, sea ice conditions in Hope Bay which prevented the main base being established there the first year, the ill-health of James Marr in early 1945 forcing his repatriation, and the shortage of supplies at Hope Bay owing to the early exit of HMS Eagle in March 1945. Despite this, three year-round bases were established, marking Britain’s first permanently occupied research stations on the continent. Port Lockroy was occupied until 1962, Deception Island until 1967 and Hope Bay until 1964. Scientific work carried out during the expedition included meteorology, topographical and geological surveying, biological research, glaciological studies and sea ice observation. The scientific observations and surveys initiated during Operation Tabarin continued after the War when its work was put on a long-term footing as the Falkland Islands Dependencies Survey (FIDS), under the Colonial Office. FIDS was re-named the British Antarctic Survey (BAS) in 1962. BAS became a component institute of the Natural Environment Research Council in 1967. It is now a world-leading research centre for earth-system science and global climate change, working with international collaborators in the Antarctic, Arctic and beyond.